Here's a question: you more or less know what you're going to get with a Jackie Chan film, certainly from his heyday in the nineteen-eighties and nineties. Loads of martial arts action, stunts only the bravest would even dream of attempting, lots of comedy, you know the drill. But even when he was riding high as one of the most famous movie stars on the planet, he made a couple of movies that were out of character despite trying to look as if they were business as usual. Not like the efforts where he showed up to appear in what amounted to extended cameos to help out his friends in the industry, and not like his appearances in The Cannonball Run flicks either. 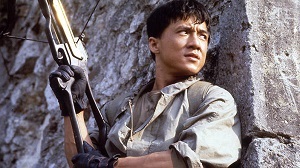 Nope, have a look at Armour of God from 1986. It arrived slap bang in the middle of his eighties rule as the King of Hong Kong action, where fans across the globe were saying not only was he the equal of Bruce Lee, the previous holder of the martial arts crown, but that he may be better. Chan had met Lee making Enter the Dragon back in the seventies, and Lee dispatches him so quickly you'd be forgiven for not noticing Chan get clonked by Bruce's flying fists, but films like Project A and Police Story were knocking Lee's stylings into a cocked hat, albeit not because the martial arts were better, but because Chan had a vision of how he wished to present himself that truly clicked. His major achievements had been those stunts, where he would place himself in mortal danger all for the sake of entertaining the audience, but it was okay, nobody really gets killed on a film set, right? Not necessarily, and while shooting the opening of Armour of God, calamity struck when one of those stunts went wrong, and Chan nearly died. He was supposed to grab onto a tree branch during a leap from a castle wall, imitating the beginning of Steven Spielberg's Raiders of the Lost Ark which had hugely impressed him as he fled "natives" with a precious artefact, but on trying the scene a second time, the branch broke and he tumbled to the ground, breaking his skull. Most stars would have called it a day after that, there were easier ways to make a living after all, but Chan was not most stars and was well aware that not only his reputation but all those who were employed thanks to him were on the line. Therefore the movie was extensively rewritten to remove the incredible stunts he had planned, leaving him enough time to recuperate as he did so while making the middle section of the story, this part's main stunt work being a car chase that did not necessitate his appearance since they could rely on stunt drivers to take care of that, with one superb jump across two elevated highways at least a highlight in a major lull in the plot. Chan teamed with Cantopop star Alan Tam as that plot had them seeking bits of the titular armour for reasons that were not wholly clear, though rescuing their shared girlfriend Rosamund Kwan was one goal: Chan also romanced (but not really) former Miss Spain Lola Forner, though that never went anywhere and though this was not the first nor last time they would work together, they did not exactly crackle with electricity onscreen. Fortunately, the finale where Chan battled fanatical monks and a troupe of black, female fighters could almost convince you had seen a proper Jackie action extravaganza, when in fact you had merely witnessed a third of one. Fast forward to 1993 and Chan starred in a movie that he has always been at best ambivalent about, and at worst outright hostile towards, which was City Hunter. Designed to appeal to the Japanese market by adapting a manga that was massive there, it saw him take the lead as woman-obsessed private detective Ryo Saeba, in effect a live action cartoon the owners of the rights were determined that he appear as. Dutifully, he did so, with prolific Wong Jing taking the director's chair, a man who is often described as crass yet enjoys a keen instinct for what will be successful among the Asian public, and sure enough there were many of his trademark bad taste gags here. 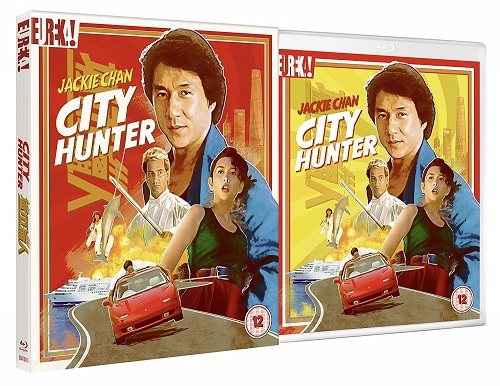 On the other hand, while Chan was not a fan, his followers have always liked City Hunter in the main, maybe not so much in Asia, but it seems to play very well in the West where the sheer ludicrousness of what was depicted struck funny bones across that vast region of the world. Yet Chan may have been essaying the protagonist, but was he really acting in a typical Jackie Chan movie? There are those who would dispute this, for he was more following orders from Wong who allowed him to choreograph the fights to a point, though otherwise this felt far more like one of his over the top efforts than it did a legitimate entry in the Hong Kong superstar's oeuvre. Every so often there would be a scene where it came across as if this was what Jackie had signed up for. Mentioning Bruce Lee before, he showed up here in footage from his posthumous movie Game of Death, where footage from an unfinished production was edited shoddily into a completely different one supposedly featuring Lee in "disguise" until they had an excuse to use said clips. When Ryo is in a cinema, that was what was playing, the fight between Bruce and Kareem Abdul-Jabbar, who must have been twice his size, hence Chan battles two gigantic black men in a nod and a cheeky bit of point-scoring against those who would judge him against the first global martial artist. The reason most of those Westerners (of a certain age, it had to be said) seemed to appreciate City Hunter was the late on sequence where the fights from the popular game Street Fighter II were restaged in daft fashion, with Chan squaring off against Gary Daniels while both were dressed as characters from the game. It was an example of the lengths this movie would go to in its goal of being as silly as possible as this was precisely the sort of reference and joke you would have expected from a cartoon, and for many viewers it absolutely paid off, though the sight of Chan simpering in drag was not as original as they seemed to think: an old set-up in a new setting. There was a plot to City Hunter, and it was not, as one might expect from a private eye yarn, a mystery, as it was more akin to Die Hard, or more precisely, Under Siege, though far preferable since Steven Seagal wasn't in this (Daniels had his hairstyle, mind you). Ryo smuggles himself among the rich passengers of a cruise liner and tackles a group of "terrorists" who want to sell them all as slaves in Thailand, all the while being distracted by the comely likes of Joey Wong and Chingmy Yau, as attractive women seem to be his Achilles heel. They were at least a shade more than decorative, rolling up their sleeves to get stuck into the comedy and action, but what you didn't get were the Chan stunts trademark, and not really his combat either, at least until the movie was mostly over. But all is forgiven if you find this funny, and there was enough here to induce laughter with its anything goes preposterousness to make it worth your while, Chan fan or not.